There is such thing as a free ride. Mountains, monuments and mammoths – just a few things you’ll see cruising through South Dakota. Though there are thousands of miles of beautiful roads to travel, these are a few of our top motorcycle rides. 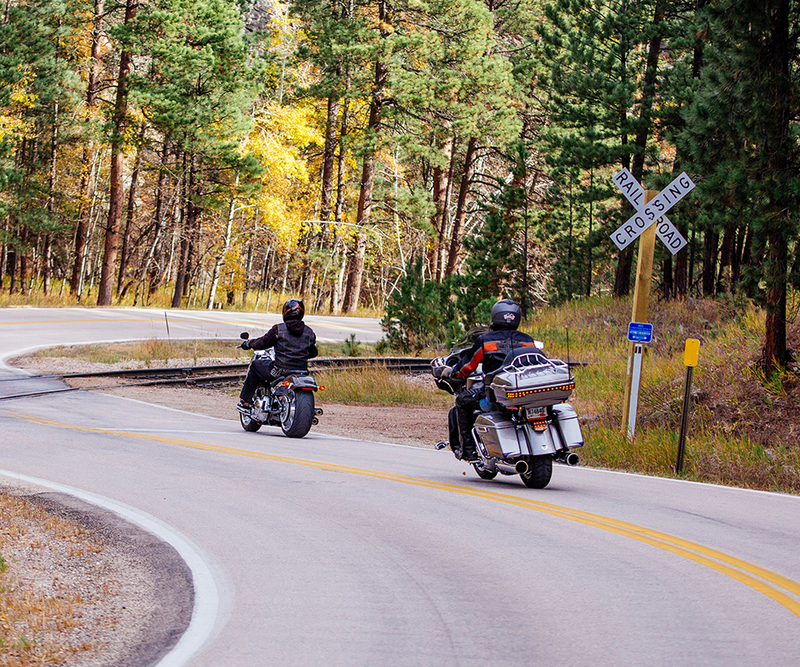 To explore your own motorcycle routes, check out our interactive riding map with helmet cam footage of each ride. A National Scenic Byway, the Needles Highway takes you through towering granite spires, narrow tunnels and winding passes. You’ll also cruise through the Eye of the Needle and parts of Custer State Park. For a slower ride packed with wildlife, a ride through Custer State Park is perfect. You could see elk, bison, eagles, deer, burros and more. Within the park, hop on Playhouse Road to swing by Center Lake. Also known as Highway 16A, Iron Mountain Road features pigtail bridges tucked into Black Hills landscapes. A few tunnels even frame Mount Rushmore National Monument for an unforgettable view. Journey through a 19-mile gorge thronged with limestone palisades, canyon waterfalls and lush vegetation. Fall is an especially beautiful time to tour with colorful foliage in full swing. The painted canyons of Badlands National Park are a desolate and beautiful backdrop for a scenic ride. The loop takes about an hour to travel, depending on how often you pull over to take in the epic views. Starting in Sturgis, Vanocker Canyon Road winds through birch and aspen trees for a serene, scenic trip. Stop in the historic town of Nemo, then continue on to Deadwood for gaming and a good time.